Airplane Theme Party . Every child dreams of flying and have wings like birds. So, let’s try to fulfill the desire of little pilot soar above the clouds on their special day! Airplane Adventure party takes the fun of child’s birthday party to new heights! 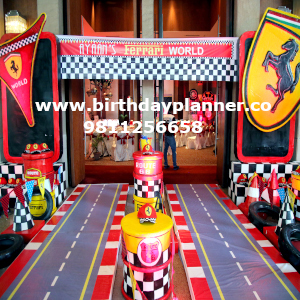 Make the birthday party memorable and unique. Invitation cards in the shape of Air-ticket highlights the party theme. 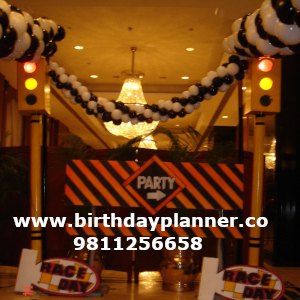 Make a sign board of Departure and Arrival at the entrance and exit door. Also made a counter with board displaying message of “Check Your Bags Here” for the gift table. Other boards like Welcome Aboard”, “Pilots and Passengers Only”, “Boarding Area”, “Just Plane Fun”, and “Up, Up and Away”. Hang them on the walls around the party space. Passage carpet should be look like runway. Airplane stickers provide to the participants to confirm the entry. Decoration Table covered with blue table clothes and white cloud shaped coasters placed on it. The plates, napkins, cups and table covers feature pictures of Disney Airplane with different shades of blue, silver and white for an Airplane party. Use colorful Paper airplanes to decorate the place. Large paper airplanes hang from the ceiling. Wrap streamers around poles, stairwells and chairs. Leave some space while wrapping the streamers and tied bunches of colorful balloons. Airplane theme party ideas. Giant Gliding in the shape of Airplane and Pilot placed near to the dining tables. Tape one end to the ceiling and then fan out the strips to all corners of the room. This will look really pretty with alternating colors or rainbow colors. Colorful small umbrellas hang at the fences. Globes placed at the center of each table. Airplane theme party ideas. 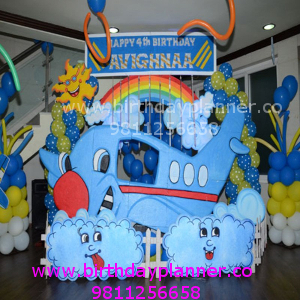 Celebration take off with a Plane shaped cake in blue color, white wings. Yummy treats such as cupcakes, cookies and candy are naturally colorful and can add flare to your food table. Top cupcakes with small toys or candy, wrap cookies in decorative tissue paper and place colorful hard candy in mason jars to make your food table pop. Royal Blue color cutlery to be used. 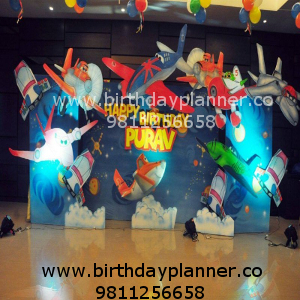 airplane theme party decoration. For food flight-pack on little trays, in little boxes or inside little bags. Each can be decorated with airplane stickers or with an Airline logo. Regular sandwiches, mini pizza, shakes, fruit juices, Cheese squares, Mixed nut, Chips and other meal accordingly. 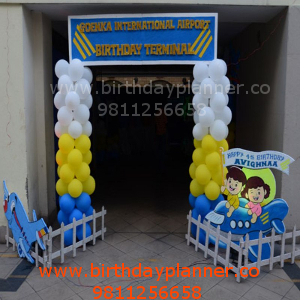 Airplane theme party decoration. Toy airplanes, jets and helicopters, Pilot glasses, jackets and hats, Toy flight badges, video game as a return gift after landing in suitcase shaped bags. 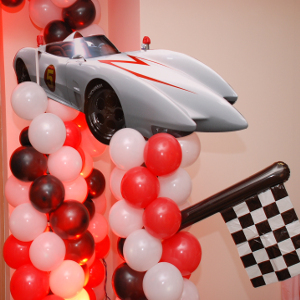 Related theme party Speed racer theme party , Fast track theme , Grand prix theme and even more..